Before we jump into guidelines, let's understand who is a growth hacker? Why would a growth hacker need to think better than a traditional Marketer? And why would he/she be considered unethical? Who is a growth hacker? Like everyone said before on the web, a growth hacker is a critical thinker, who thinks about user retention before the product is fit for the market. Why would he need to think better than a traditional marketer? Growth hacking is a term coined by Sean Ellis -the co-founder of Dropbox. A growth hacker needs to come up with innovative ideas to execute in an online marketing ecosystem (i.e. social media, blog, web analytics) with a low budget to get more exposure or to acquire more customers instead of dumping money into traditional media channels such as: television, radio or newspapers, etc. Why should he be unethical? He should think about only product growth and he should not worry about whether his idea/execution will be ethical. As an example when AirBnB automated the Craiglist postings, their only concern was leveraging the product. Basically people that can single handedly make amazing growth conversions would make a great growth hacker. A G-hacker must analyze the ins and outs of the product/service, from engineering to design to content. Are you thinking from end user perspective? How well is the product (existing) performing in the market? What you can do to disrupt the market? Before fixing the goal, you need to know what you want to achieve and also you should also be clear about how you’re going to achieve it. If you need huge but targeted traffic for your startup homepage, you have to decide on the numbers first-i.e., as to whether you need get the 100k hits or 200k hits. Then work on executing a creative advertising campaign in Google adwords or through blog content to attain the massive traffic. If you choose blog posts, decide how many posts you need to get the 100k hits (if that is your goal) and how you’re going to promote the content to achieve said goal. There is no need to keep coming up with new ideas. Testing your ideas to check which one is working and which one is not, is the most important aspect of growth hacking. Data analytics, behavioral psychology, design and user experience are also important to perform an experiment successfully. 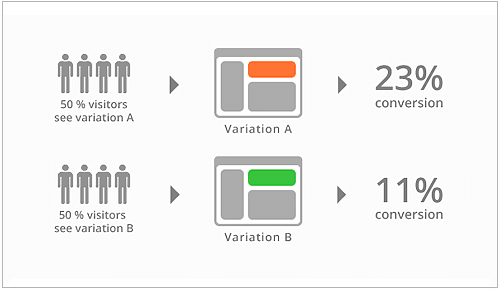 A/B Testing relates to comparing both, the A&B versions from the user’s perspective, then settle on the version the version that works better. Checking the impact of your heading, button colors, E-mail subject, Landing pages or any other logo is how A/B Testing is performed. You may also check for various factors such as pricing structures in your website or free promotions. In Japan, Facebook lists the blood type of all the profiles. Japanese believe that each blood type has certain personalities, so FB mentioned blood type as a field in Japan. But in Russia they bought keywords for everyone’s name and ran ads (because the first thing Russians do was to search for them online) both the experiments work for them because of the right analytics and user psychology. Here, the conversion rate shows which variation works. It might be a blog post title or an E-book title; that’s the first thing that makes the visitor click on it. So the titles must be catchy. Some people say time is not a constraint for G Hacker, which I disagree with. Because time matters a lot when it comes to growth hacking. Because every product/service is not based in the eastern time zone. Proper execution is a thousand times better than just an idea. It's only execution that brings out the potential of your idea. If an article has to go viral, you’ve to come up with catchy title that makes people click, consider the time of submission, and promoting it on the right platforms. Users are always excited about every product/service which they would like to try. You just have to keep them happy to retain them. You have to improvise and tailor your product as per the market need to retain the users that you already have. Later you can think about acquiring new users. ​Copywriting skill is an added advantage for a G Hacker. Write something that makes the user click and read. It also saves your time, since you’d generally not need someone else to proofread your content. Following the trend is a trap. People who set new trends will bring enormous results through their ideas. Facebook sets up a new user profile trend and now a days others follow the same trend including Twitter and Google plus - people then term it “Facebook-esque” or “Facebookish”. Choose the right tool that drives you to attain your goal. I used Topsy to look up what people tweet most, what type of content that people like to share it on twitter and to collect influencers list to follow. In actual fact, Topsy.com (shut down now) is a free online tool that allows you to search trending tweets on specific date range, to find influencers to get in touch with, find who has re-tweeted your tweet and monitor the trending topics. 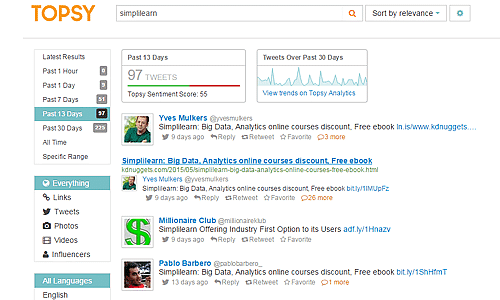 I chose Topsy instead of Buzzsumo which almost does the same because it is a free tool that worked well for my need. Never ignore the small things. You have to be careful when it comes to minor details about the product/service. Without analytics, growth rate is meaningless. Analytics is the guide that gives you highly valuable data. Keep on monitoring the data and look for potential opportunities to take up the product/service in growing path. I used a tool called Sniply that attaches a call-to-action to every link you share on the web. 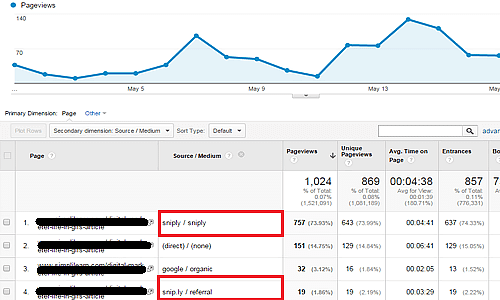 I found the potential of Sniply through Google analytics and utilise it for my growth hacking strategy. It is important to collect the data generated at each and every level of organizational hierarchy. This data helps a G hacker make a decision. To reiterate: never forget to speak to your colleagues from the very top (CTO), to the juniormost (Customer support) profiles. A growth hacker must be in touch with all kinds of profile inside the organization. A growth hacker needs to analyze how long your product will meet customers’ needs and any plans to redefine it again to keep customers on board. Obviously the product and services need constant up-gradation on time. Along with the product, redefine the distribution strategy if there is a need. Burbn allowed people to check in at particular destinations, make arrangements for future check-ins, gain points intended for spending time with pals, and also post photos of the meet-ups. Burbn had not been very effective and was complicated. 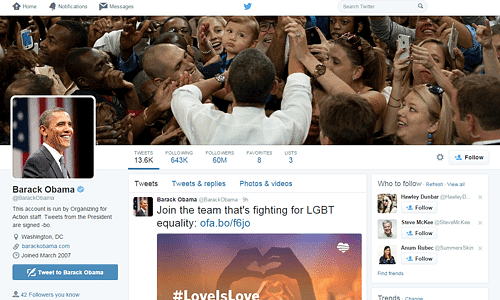 Kevin Systrom, the founder paid attention to how individuals were utilizing it. He brought developer Mike Krieger on-board; the pair utilized analytics to decide how, precisely, the individuals were utilizing Burbn. They found that their users weren't using Burbn's as a check-in app. People were submitting and sharing photos like there was no tomorrow. By then, Systrom and Krieger chose to double down the data: they began to focus on their photo sharing framework and scrapped practically everything else. Burbn would turn into a straightforward photograph sharing application (Instagram). You have to take actions based on results (performance). Keep testing as a non-stop process, fine tune your strategy or distribution methods if there is a need and repeat the process to reach your goals. This is the most valuable thing that a ‘G hacker’ should work on. Start networking with related people and online communities while you are building the product, so that these people can offer feedback, suggestions and this would also be helpful in promoting your product. Your intention should not be just to promote your product or service, the more you help the community or people, the larger your networking size and the credibility of your network. So it is not just sending a tweet to review your product or asking someone to like your Facebook page. You’ve to participate in conversations, clear your peers' doubts, and enlighten the people who need you. You do not have to stick to a predetermined pattern. Trends change with time, so act accordingly. Once you start to think like an end user, you can achieve almost all the goals as a growth hacker. You just have to follow the above guidelines to become an awesome growth hacker. So. What do you think? Do you have any more guidelines for growth hackers to follow?